Read the resignation letter from University Professor Bill Wulf (Computer Science). It’s a beauty. It reminds me of one of those letters that your write in a fever and then debate whether to send or not. Bill Wulf is not a slacker. It’s unclear whether his wife intends to follow him. There are other tweet rumors that the Vice Rector, Mark Kington was also in the process of has resigned. The vice rector is the second ranked member of the Board of Visitors who forced Sullivan to resign. Governor McDonnell of Virginia, appears to be cautiously critical of the board’s actions. But half of the board members are his appointees. And what of the interim president who was appointed today to take Sullivan’s place? Zeithaml will take a leave of absence from the McIntire School during his tenure as interim president. In March, Bloomberg Businessweek ranked the McIntire School as the No. 2 undergraduate business program in the country, and the No. 1 MBA feeder school. He specializes in the field of strategic management. He joined the McIntire School in 1997. It sounds like the university community knows *exactly* what’s going on, who is doing it and why. This isn’t about change. It’s a corporate coup of MBA management assholes who are going to restructure the University to be more attentive to their needs. They know nothing about academia but they have a lot of experience with management techniques. Gawd help UVa. They’re going to need it. If UVa doesn’t have an Occupy group, now’s a good time to start one. If they were located closer to a major metropolitan area, they’d be getting recruits to help make some noise. But Charlottesville is kind of isolated. Nevertheless, I hope the protestors get the attention they deserve. When it can happen at UVa, no university is safe from the bonus class. Update: the more I read about the forced resignation of Sullivan, the weirder this story gets. A couple of sources (Here and here) are reporting that the board of Visitors did not meet to take a vote to get rid of Sullivan, that there was no unanimous vote and that Rector Dargas has been planning this resignation for months in secret without any faculty input. 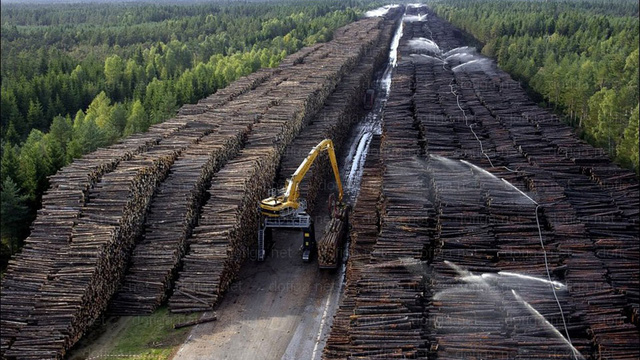 Worlds largest woodpile, Byholma, Sweden. Update: Is it possible that the firing of Teresa Sullivan from the University of Virginia is part of a ratfucking operation to get Elizabeth Warren in Massachusetts?? See this post at Brietbart (Ewww) for details. Firing Sullivan may be the first step in making Warren look like she is guilty of scientific misconduct. Regardless, the Board of Visitors should be investigated. Who are they taking orders from? Derek Lowe writes a response in Slate to a recent Slate article that claims that we need more scientists and mathematicians. No, what we really need are more jobs for the hundreds of thousands of STEM majors who are out of work right now. Theresa MacBain, the Methodist pastor who recently came out as an atheist, gave a short interview on Fox News radio. It’s only 9 minutes. Well worth the time. She did very well and held her own. Good job, Theresa. It’s not easy taking on the blowhards at Fox. Let’s hope some of this interview percolated into the minds of the listeners. Theresa is presently directing the Clergy Project, an initiative to help non-believing pastors make the transition into the civilian world. The purpose of the Clergy Project is not to deconvert practicing pastors. The pastors that join the project are already past the point of deconversion. They just want out of the pulpit because they want to stop living a lie and they need to make a safe landing. The number of clergy who have joined the project has swelled dramatically since McBain and another graduate, Jerry DeWitt, have barnstormed the country in the past couple of months. They have almost 300 members and many more clergy who are on a waiting list to be screened before they can join. In another sign of the atheist apocalypse, Linda LaScola, a researcher on religion, gave an interview to CNN about the rate of deconversion and its future effects on politics. The days of the religious right strangling the country and squashing modernity are numbered. As more people turn away from religion, there is an associated trend that shows they are becoming more liberal. So, you have to wonder why Democrats seem scared to death of the religious right. If they just hang in there and stop ceding ground to the conservatives, in a few election cycles, the pendulum will have swung the other way. In fact, Republicans seem to be frantically throwing everything but the kitchen sink at the electorate this year because they know they are rapidly running out of time. Before long, there won’t be enough elderly, conservative religious voters who they can conscript for the plutocrats. By the way, did you know that up until recently, most people stayed with the religion traditions they were brought up in? And according to Bob Altemeyer, author of The Authoritarians, “amazing apostates”, those individuals who reject their fundamentalist upbringings and become secular do so at the rate of about 1%. What the data shows recently is that the rate of deconversion is picking up with greater access to the internet. Previously, that 1% shared some common characteristics, such as being good in school and valuing truth. In other words, we don’t just accept what people tell us unquestioningly no matter how much our parents isolate us. Altemeyer also found that there are a few people who go the other way from secular households to religious conversion but these people tend to be less well educated and they make their conversions after some life-changing event like an illness, unemployment or relationaship failure. In other words, religious conversions happen when people are most vulnerable to persuasion and to individuals who are least able to reason their way out of it. These findings are similar to my own experience. I never believed the fundamentalist crap I was fed and to get me to believe it now, after I have seen the proof of evolution in my research and now know the historical facts behind the bible, would require me to undergo a lobotomy. Something very weird is going on at the University of Virginia. Last week, the President Teresa Sullivan, was asked to resign abruptly by the University’s Board of Visitors, which is like the Board of Regents everywhere else. The reasons for the resignation are not clear. Even Sullivan herself is not actually sure why she was fired and the board is not answering questions to anyone’s satisfaction. This move came 2 years after Sullivan was appointed and has, by all accounts, done an admirable job. “The Board believes that in the rapidly changing and highly pressurized external environment in both health care and in academia, the University needs to remain at the forefront of change,” [Board of Vistors chair] Dragas wrote in her initial email announcement. I have no idea what that means or why it pertains to Sullivan’s dismissal. I guess it means that stuff is changing. So the university must change. Firing a president is change. It sounds like the financiers’ values have come to the University of Virginia because they loves them some change! The bizspeak jargon is always a bad sign. No one knows what it really means, not even the speakers. This leaves a lot of leeway to interpret the jargon on the fly to justify just about anything. Vaidhyanathan suggests that donors to the university want more control over how their donations are used. Maybe they want more influence over the curriculum or benefits or hiring. Whatever it is, they want to impose change on their timetable and in their way without some capable university president who specialized in class dynamics and the sociology of debt getting in the way. Did I mention that the University of Virginia has pretty reasonable tuition compared to its peers? How much do you want to bet that that’s going to Change!™ now that the bonus class has got its grubby mitts on the steering wheel? Cut back on wages benefits here, hire some more poorly paid adjunct professors there, get more companies to foot the bills for research, raise tuition 30% over a few years and voile! This is not a charitable institution, after all. Why should University of Virginia students and their parents get off easy? The students and faculty have turned out for Sullivan and latest reports say that 4 of the 12 members of the Board of Visitors have approached Sullivan to ask her to stay. But this is not a good working environment for anyone at the University and Sullivan warns that the faculty may be poached by other universities looking to pick up spooked researchers and professors. Researchers need to be able to plan and require a contiguous and stable environment and this crap from the Board of Visitors is undermining that. They’ll get their change for sure but what they will be left with won’t be worth anything after they’re done. The university’s faculty need only look at the smoking hulks of our empty industrial labs and extraordinarily well compensated former MBA overlords to know what will come next. Another disaster brought to you by the Goldman Sachs family of assholes. More office chairs. I’m still pining for the white leather one from West Elm but the damn thing never goes on sale.